Blurb: An energetic, enigmatic, and exciting concoction of electro/industrial from a hot new artist emerging from NYC’s musical underground. New York remains one of the most artistically dynamic cities in the world, so it is no surprise that such an entity as Garek would emerge from its underground music scene. 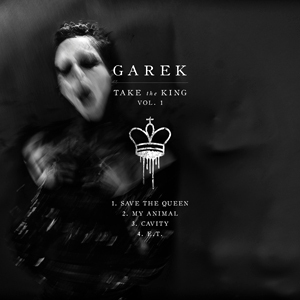 With his debut EP, Take the King Vol. 1, Garek introduces listeners to his distinctively dark yet energetic style of electrified industrial, a hybrid of emotive melodies and dark atmospheres with an explosively belligerent appeal. No better example of this can be given than the opening track, “Save the Queen,” in which a delightfully simple yet caustic synth bass and whiplash drumbeat underscore Garek’s slithery, sensual vocals. The chorus kicks in with a burst of enticing ambience and a catchy refrain that this writer challenges any listener not to sing along with, the multiple layers of harmonies bringing the track to a luscious climax. “My Animal” follows with a pulsating bass and infectious groove that recalls numerous dance hits from the ‘80s, a harpsichord-esque arpeggio and clever manipulations of the vocals in the bridge and chorus adding a nice dimension that showcases Garek’s production savvy; the only downside is the song’s short length, leaving the listener begging for more. “Cavity” slows the pace down and reaches for an even darker, more menacing vibe, the combination of foreboding whispers and shrill screams to accent the chorus playing well with the song’s stylized synth warbles reminiscent of dubstep. Finally, a cover of Katy Perry’s “E.T.” closes the EP out quite effectively with subtle chugs of guitar accenting the overdriven synths; whether you are a fan of the pop star and/or her original version of the song or not, Garek’s version stands on its own as a playful yet forceful track that many are sure to enjoy despite themselves. Of course, in this writer’s opinion, the full breadth of Garek’s artistic skills can’t be fully appreciated without the accompanying music videos, all of which demonstrate his penchant for theatricality and visual flair that only serves to strengthen the music’s allure. Clocking in at a little over 12 minutes long, Take the King Vol. 1 is an all too brief affair, but as its title indicates, there is hopefully more to come from this enigmatically exciting artist.